Wax is suitable for use on Worsted and Wool materials and is usually removed from the material by the application of a warm iron. Available in natural, white, yellow, blue, red or black or as an assortment. They are supplied as either an oblong shape with two marking edges or a pencil shape with a protective paper wrapper. They are also produced for use with an Ultra-Violet lamp which then shows the mark as GREEN FLUORESCENT which glows under the lamp. 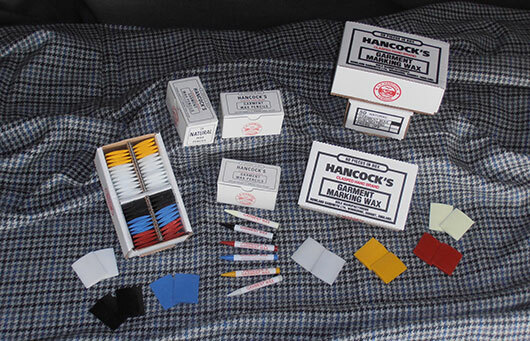 Packed in a printed corrugated box 50 oblong pieces or 25 pencils. Dark coloured chalks should be used with EXTREME CAUTION on pastel coloured material and the standard precautions should always be taken before marking–up. Available in packs of 50 pieces.